Everything you need to create exceptional mobile experiences through your mobile app. Smart filters to get your users faster, to the products they desire. Recover abandoned carts with automated push notifications. Drive more revenue from your existing customer base. Recover lost revenue and abandoned carts with automated and triggered push notifications. Unlike other channels, Push Notifications create an urgency which gets noticed instead of being lost in the inbox. 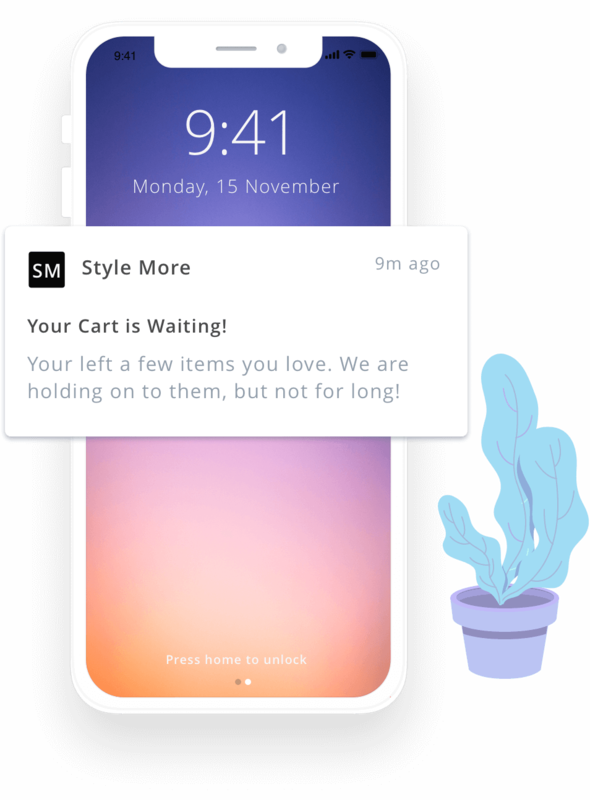 One click on the abandoned cart push notification takes the customer directly to the cart, shortening the purchase path and driving more conversions. Test as many push notification you want and don’t spend a minute on coding any of it. Create push notifications with combinationation of text and images and test them out for conversion. Run discounts on only the products you want. Keep complete control of the products and collections you want to include in the sale. Link the flash sale banner with the items on sale and take your customers directly to action. Our vertical wise benchmark data for delivery, CTRs and conversions, help you align your push notifications for better conversions. Make use of deep industry expertise to achieve goals quicky and efficiently. Recover Lost Revenue and Convert Abandoned Carts Now! Our Mobile App Expert will connect with you in the next 24 hrs. Plobal Tech Pvt. Ltd. © 2019 All Rights Reserved.